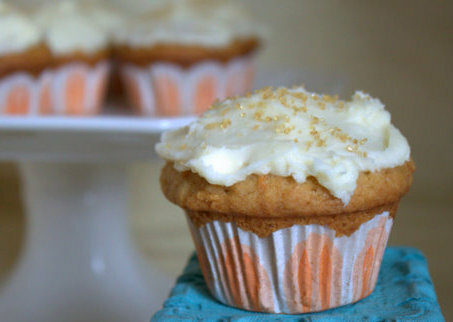 These Carrot Cupcakes, topped with Cream Cheese Frosting, are soooo good. And they’re especially perfect for Easter. Though, I must confess, I’m not usually a carrot cake fan these days. I used to be, but something changed. When I was younger, certain foods exercised my gag reflex like, I don’t know, Richard Simmons sweatin’ to the oldies. And others, I loved so much I thought there was nothing better in the world. But over time, there’s been a little switcheroo with many foods. Those I loved, I suddenly realize I can’t stand ’em anymore. Foods I hated? I’ve developed a new appreciation. Take cantaloupe and honeydew. Used to eat them all the time, and loved ’em. Then I realized one day I was choking down a bowl of diced melon, and I thought to myself, “I hate these.” Oh! Okay. Or walnuts. Since I can remember, those durn, dasterdly bitter gag-worthy nuggets just hung out in otherwise perfectly good chocolate chip cookies and banana bread. (Bless my mom, who always cooked up a few walnut-free chocolate chip cookies just for me). But I must say, I’ve actually learned to appreciate the dreaded walnut. Candied, and tossed into in a good salad? Yum. Chopped or ground up fine and baked into baklava or secret kiss cookies? Actually, yes. Today, though, is about carrot cake. I know it’s practically un-American to hate carrot cake. I know I risk the wrath of millions (okay, maybe about 100 if enough people read this) by saying it, but I realized a few years ago that I truly hate carrot cake. The only good thing about carrot cake was the cream cheese frosting. Is it the walnuts? Is it the raisins? Is it the other stuff people cram in there? I have no idea. So I left out the walnuts, pecans, the raisins, and even some of the carrot – a half pound instead of a full pound. … and ended up with some cupcakes that I loooved. And, I’m sure, will always love. The cinnamon, ginger, and clove sets off the carrot just right, and the cream cheese frosting adds the right hit of tang and sweetness. 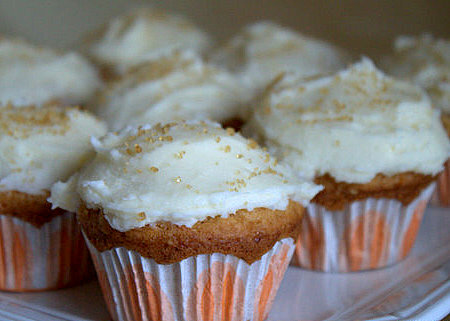 Cinnamon, ginger, and clove set off the carrot just right, and the cream cheese frosting adds the right hit of tang and sweetness. Heat the oven to 325 degrees Fahrenheit. Line 18 regular-size muffin tins with cupcake paper liners. In a large bowl, mix together the carrot, eggs, sugar, vegetable oil, buttermilk, and vanilla. In another bowl, mix together the flour, baking soda, baking powder, cinnamon, ginger, cloves, and salt. Mix the flour mixture in with the carrot mixture until well mixed. Pour batter into lined cups. Martha recommends filling the cup about 2/3 cup full. I like to live dangerously and go for a little over 3/4 full – usually a 1/3 cup measuring cup gets me close. Bake for 23 to 28 minutes. They’re done when the top springs back when you tap it, or a when a cupcake tester or toothpick comes out clean. Cool on wire racks for about 10 minutes, then pull the cupcakes out of the tins and let them cool on the racks completely before frosting. Make the frosting. On medium speed, beat together the butter and cream cheese until fluffy. Reduce speed to low and add the powdered sugar, 1/2 cup at a time. I really advise against more than that, because you may find yourself disappearing in a powdered sugar cloud. Not that I’d know, not at all. And finally mix in the vanilla. And, frost your cupcakes! I topped mine with a little Demerara sugar for a little extra sparkle. Sounds yummy – I can’t stand raisins or non-cream cheese frosting in my carrot cake! These photos look exceptionally amazing and clear!!! rad about sums it up… yum!